Like my grandmother, I have a hard time keeping any houseplant alive. Outdoors we can grow almost anything but bring it past the threshold and an untimely death is in its future. My husband tells every new plant I bring home, “I’m sorry she’s brought you here to die.” However, Granny knew Christmas Cactus care and she taught me. Hers was on a plant stand with tendrils cascading over and touching the floor. Almost everyone in the area had a plant from hers. Generations of people have cuttings from those cuttings. The Christmas Cactus is often passed down from generation to generation. The mother plant and all the plants made from its tendrils. This is probably because propagating the Christmas Cactus is so easy. As a word of interest, even though it’s called a cactus, the Christmas Cactus is decidedly different from what we think of a cactus. It doesn’t prefer the high desert environment true cacti love but instead prefers a tropical environment like the orchid. It does require some special care. The first thing we consider when placing our houseplants is light. The Christmas Cactus will thrive in direct, bright light. To keep it indoors year-round, place it near a window or glass door. Keeping your Christmas Cactus outside will work, just be sure to keep it in the shade. Granny kept hers under the big oak in the front yard. Exposing the Christmas cactus to high temps and direct sunlight will stunt its growth and cause its leaves to be burnt. Just as keeping them in high traffic areas may cause them to be bumped and bruised. They also do not like being kept in drafty locations, or near heat sources like vents or heaters. If you keep your cactus in a relatively dry environment, provide a source of humidity for it. This can be done by simply placing a shallow pan of water under the plant stand or near the plant. I prefer to put a watering tray filled with gravel under the plant and fill the tray about half full of water. Evaporation will create the perfect 50-60% humidity the plant loves. Being in the deep south, Granny never had to worry about humidity levels. Christmas Cactus doesn’t like dry soil and needs to be watered regularly to maintain a moist soil. Water at the base of the plant, not over the green tendrils. You can mist the tendrils occasionally, but don’t water them. If your Christmas Cactus gets too dry, its health will degenerate before you know it causing it to drop its flower buds and tendrils. Even though it likes to be moist, too much water can kill it. Overwatering is deadly much faster than underwatering. The balance is delicate but don’t be discouraged, check to see that the top inch of soil is dry. If it is, water. During your dry season or if you live in a dry climate, water your plant every few days. If you live in a humid climate, cool climate, or keep your plant indoors, you should only water once a week. Keep in mind the watering tips we talked about before. When cool temperatures move in for the fall and winter, you’ll water less often. This will encourage blooming. Don’t worry, we’ll talk about this in just a bit. NOTE: Stop watering your Christmas Cactus the first of October in preparation for blooming. You’ll see why when we talk about blooming. For Christmas Cactus soil, I recommend using quality cacti soil like you would for succulents. Potting soil isn’t revitalized like outside soil where we practice soil maintenance. This means you’ll need to offer your Christmas Cactus a fertilizer specifically designed for blooming plants. The joints of the Christmas Cactus are fragile. If the plant is unhealthy, the joints are where it will fall apart. Lightly fertilize the Christmas Cactus at least twice a year, preferably 3-4 times a year. It actually likes a tight root system so only re-pot your Christmas Cactus every few years. NOTE: Stop fertilizing your Christmas Cactus mid-October in preparation for blooming. Flower buds on your Christmas Cactus are naturally triggered by the change of season from summer to fall. They will bloom for 4-6 weeks. However, you can control this response, so you will have beautiful buds and blooms for the holidays. There are at least three schools of thought on this process. One is using darkness alone; another is using temperature alone, and thirdly – the one I get the best results with is a combination of darkness and temperature. I’m sharing this one, so you’ll have the information you need for either method you prefer of Christmas Cactus care for beautiful blooms. 6-8 weeks before Christmas, or Thanksgiving if you want blooms to begin around then, place your Christmas Cactus in a completely dark room for 12 hours at a time. You’ll want the temperature to be around 60 degrees. Be sure too never expose your plant to freezing temperatures, it will die. Granny put hers in a closet. During the day, place your Christmas Cactus in a spot where it can be exposed to light for 12 hours. If you live in an area where there are fewer daylight hours, use a grow light to supplement. This 12 hours of darkness/12 hours of light schedule will ensure your Christmas Cactus is covered in color all through the holidays. You stopped fertilizing mid-October and you stopped watering for the month of October. Keep the humidity levels up as we’ve already discussed, but don’t start watering again until November. On November 1st, begin watering again, BUT only enough to keep the soil barely moist, not wet. Saturated roots will cause dropped tendrils, flowers, and buds all at once ending your blooming season. If you see flower buds forming before you want them to, decrease the temperature and increase the number of dark hours to slow them down. When you’re ready for the blooming party, increase the temperature and light exposure and the plant will ramp up the process. Once you begin to see flower buds forming, you can return to normal Christmas Cactus care. Gradually increasing the number of light exposure hours and amount of water will make this transition easier on your plants. Dropped buds are disappointing. It’s happened to me more than once. Remember, I’m challenged with indoor plants at best. It’s so frustrating! Like I said, the Christmas Cactus can be fragile and tookie about its care. There are a few reasons for dropped buds. You’ve over-watered, not enough light exposure, and/or low humidity levels. If your Christmas Cactus drops its buds and you’re not sure what you’ve done wrong, try decreasing the amount of water and add just a little fertilizer to the plant, give it longer light exposure, and increase the humidity level. One or all of these should solve the issue unless you didn’t catch it quickly and have saturated your plant killing it. After your Christmas Cactus has wowed you and your loved ones with its beautiful blooms, it deserves a rest. 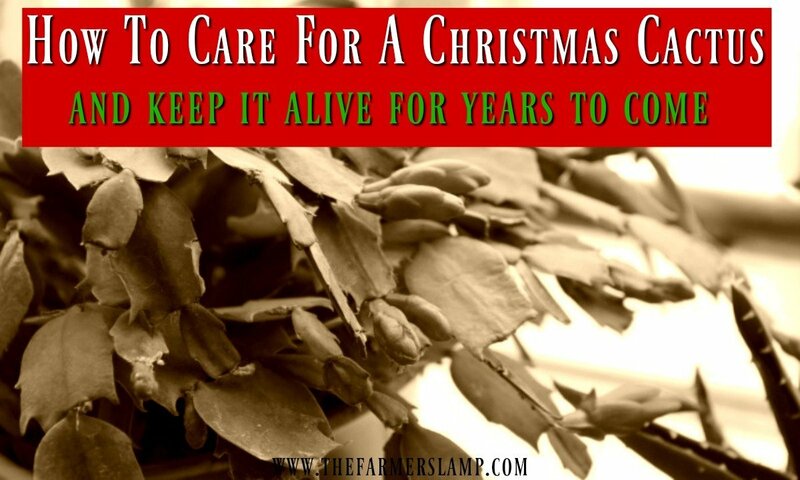 To do this, stop watering your Christmas Cactus after the last of the flowers fall. One month after blooming has completed, it’s time to prune the Christmas Cactus. To do this, snap off a few y-shaped sections at least three segments long, from each stem. This will encourage new growth. Don’t throw those cuttings away. Christmas Cactus is a star in the propagating world. It’s easy to share your plant and create traditions by giving starts to friends and family. I had a work acquaintance once who shared a beautiful story with me. Her grandmother had died and she was blessed to be the one who got her Christmas Cactus. The plant had come from one her great-grandmother had given to her grandmother. All of her aunts had a start from the grandmother’s plant so they wanted her to have the treasured Christmas Cactus. For their first Christmas without her grandmother, she had started and brought to bloom a cactus for each of her cousins, cousins-in-law, and her dearest friends. They were all thrilled with the thoughtful gift. She gives them for sorts of occasions. She always attaches a history of the plant and instructions on Christmas Cactus care. You can do it too. Use the segments you pruned or snap off more segments to have as many healthy plants as want. Allow the segment to dry for several hours to harden off before planting it. Start your transplants in 3” pots. If possible, use the same type of soil the mother plant was potted in. If it’s possible, add a little of the mother plant’s soil to the pot. Some people say it helps prevent soil shock. Filled your pots with soil while your segments are hardening off. Push each segment deep enough into the soil to cover one-half of the first segment. Give it a little water just to moisten the soil. You don’t want to give it root rot. Your new transplants should be treated like your mature Christmas Cactus. In one month to 6 weeks, the transplant should have a strong root system is in place. When you see new growth, you’ll know you have succeeded. They will quickly. Once your baby Christmas Cactus has produced one new segment, and lightly fertilized it. It should be fine in the 3” pot for 2-3 years but if you notice it looking unhealthy, you may need to re-pot it sooner. Keeping it lightly fertilized will prevent soil depletion until it’s time for potting. Most Christmas Cactus growers recommend repotting in the Spring. Their reason is it’s the dormant time for the plant, it’s not trying to bloom. Re-pot as you would most any plant using fresh, live soil. If you don’t make your own potting soil, be sure to purchase quality soil for your Christmas Cactus. The Christmas Cactus likes a tight root system so put your plant in a pot that’s just right for it, not one which is too large. I’m as careful as I can be when repotting, but I always have damaged plants. You can usually re-pot any segments which break off, but often mine are too bruised and even smashed to make it. Christmas Cactus care is a little more precise than many other plants. However, the challenge makes the success all the more treasurable to me! With a little care, your Christmas Cactus could be around to brighten the holidays for many generations to come. Who knows where and with whom it will be shared? Just imagine! Do you have tips on Christmas Cactus care, especially any repotting tips? Please share them with us in the comments below. Great tips! My grandmother also had a Christmas cactus, and I’ve often thought about getting one, too. This might have to be the year!